Victorique is finally where she needs to be… Good thing? Bad thing? Well, no matter, because she’s there anyways. Meanwhile, Kujo is pretty much at the same location in Saubreme, except outside, currently busy talking to his teacher that suddenly came out of a trunk Just accept it and take it as normal. 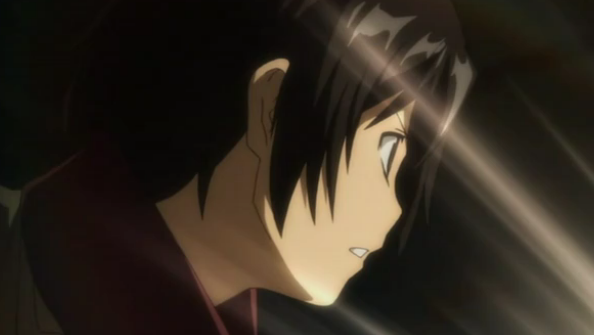 When he hears that Victorique was taken by her father again, Kujo runs and runs inside to try and find her so that he can protect her, as small as he may be. He finds her just as she’s about to enter a shady room from a shady staircase. 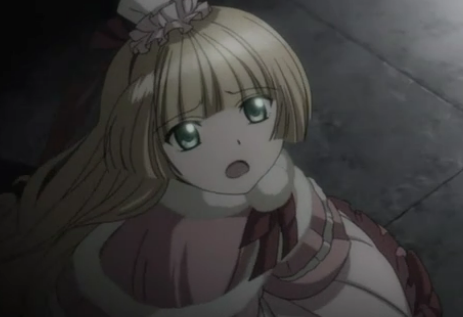 Surprised, Victorique looks at him, gives a look that says “I’m really glad you’re here and I want you to take me away”, then tells him “don’t come and get me” and leaves right after that sad look on your face? Do you really think he’ll listen to you?. After Victorique enters the room where she will have to solve the mystery, we are explained the basics of the Coco Rose mystery, and Kujo decides that he will try and help her out as much as he can. He starts walking around, while he is silently stalked by a mysterious man with red hair I wonder who he is…/sarcasm. He then learns many things and starts gathering information on certain people that may be involved in the case, while Victorique can’t figure anything out because she doesn’t have enough information. Manly little Kujo is taking the initiative. Go on, little boy! Once Kujo has found out enough, he comes back to go and tell Victorique, then follows Brian Roscoe into a secret entrance to the building. Once he leaves him for his girl, he enters the room where Victorique is, only to find another Brian Roscoe! Confused just like me, he tries to ask him how he’s here and there at the same time, but the shady second Roscoe leaves in a puff of smoke and leaves Victorique on the floor, where Kujo goes to get her. He then pulls out a speech of love friendship to Victorique and how important to him she is, then they both go and solve the mystery as Victorique is allowed out of the shady room. This show is turning out to become much more cheesy and unoriginal than I thought, it’s purely entertaining and I wouldn’t call it of extreme quality, but it has its dose of interesting matters still :). First off, it was pretty much already established but the mysteries in this weren’t the best and that really wasn’t the reason why most people watched this show. Moreover, it’s very corny and I find the whole thing quite Disney-like in the adventures and such. This last mystery is okay, once again not one of the best, because we have been leaked pretty much enough information to figure out more or less what happened with the Coco Rose case. However, what I really liked from this episode was that for once, Kujo was very useful and figured out a lot of information by himself, and if it wasn’t for him Victorique wouldn’t have been able to figure out anything. I was also very intrigued by the fact that there are two Brian Roscoes… So apparently he has a twin brother? How that is related to anything, and how that adds to the current mystery makes me completely clueless, but hey, I’m still going to hope that it’s not just something the producers felt like putting in there just for the hell of making us question ourselves. 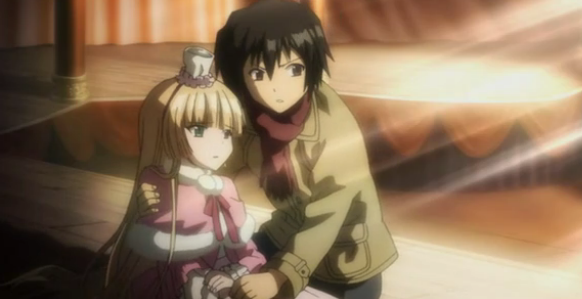 Tagged anime, episode 20, gosick, review. Bookmark the permalink.